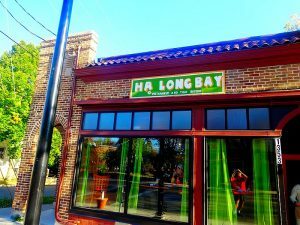 Ha Long Bay’s menu is enormous, but everything is great no matter what you decide to order. It can definitely be a little overwhelming when you first look at the menu, but the staff is always willing to help you decide! Everything on the menu is very well priced, especially because the dishes can easily be shared, which also makes it fun to go with a group. The more people you go with, the more dishes you can try! The atmosphere is energetic and fun-filled. The staff is extremely friendly, and my friends and I even have a favorite waiter who’s section we always make sure to sit in. There restaurant is always filled with young people, who are wearing anything from sweatpants to jeans. In early May, the restaurant entrance was hit by an SUV, but good news is that no one was hurt and restaurant is expected to re-open in mid-June. Be sure to make a reservation for the grand re-opening!